MK1 MOD 1-M: 4 lbs. 8 oz. MK1 MOD 2-M: 4 lbs. 4 oz. If you’re ready to try a piston AR upper and you want a compact weapon without having to do all of the hoop-jumping associated with short barreled rifles, the Primary Weapons Systems MK114 is the upper for you. The PWS MK114 is built to respect the M4-type upper pattern and is field proven to be lethal at 500 meters with a number of different ammunition. The PWS MK1 is the base of this and many other Primary Weapons Systems long stroke piston AR uppers. These uppers utilize a one-piece operating unit that consists of a floating piston head and bolt carrier group connected by an operating rod. Fewer individual moving parts equal fewer failures and performance that doesn’t hinge on excessive operator maintenance. The PWS MK1 Mod 1 upper features an adjustable gas block, quality FNC Life HD treated components and the convenience of free-floating hand guards with built in Picatinny rail and quick disconnect attachments built in. The PWS MK1 Mod 1 is the upper of choice for the operator who wants to move toward a more reliable, modern system while maintaining the familiarity and assurance of a hearty feeling upper and forward assist. The PWS MK1 Mod 2 is a more aggressive evolution beyond the standard AR upper. While it is still a quality forged upper, it has been given a facelift. PWS has been busy shaving excess mass away as well as removing the forward assist. With a weapon as reliable as the PWS MK1 Mod 2, there’s no need to retain it. 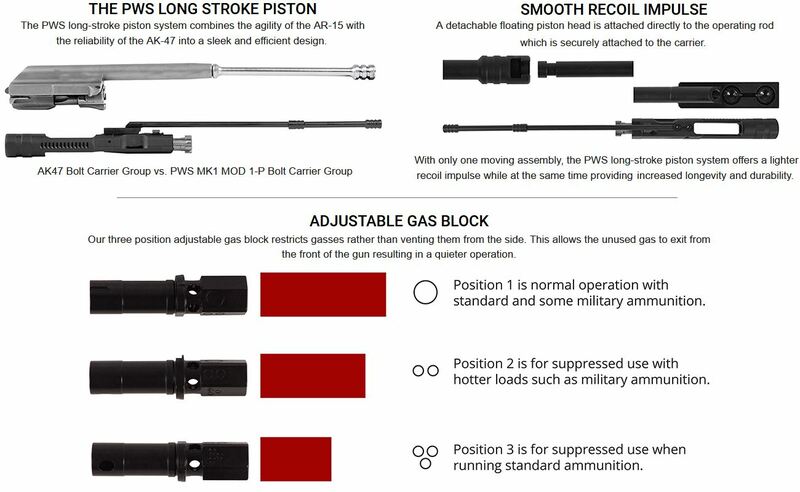 A section of PWS’ own PicMOD® rail system has been added to allow the use of either Picatinny or M-LOK accessories without requiring obtrusive adapters. The result is a sleeker, more efficient upper that is ready to leap into the fray without holding you back with unneeded weight or unnecessary appendages. Which version of the PWS MK114 you choose is up to you, either one will push your evolution beyond the competition, you just have to decide how far you’re ready to go. Primary Weapons Systems, Because It’s Time.